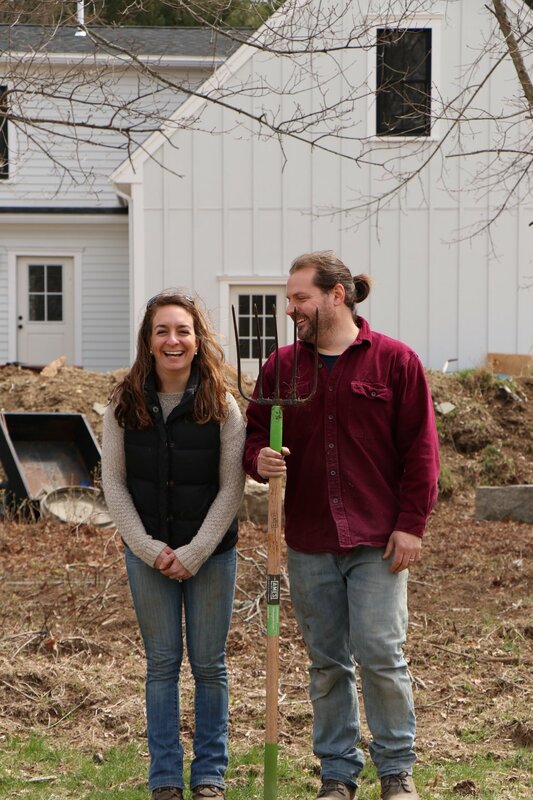 Revival Farm is owned by Justin and Kathryn Shepard. On our very first date Justin told me that when he was little his family raised goats...I think it was love right then and there. We both have great passion for the outdoors, animals and taking on huge projects. I grew up taking care of a slew of animals from hamsters to horses and Justin has had goats, rabbits and dogs. When the opportunity presented itself for us to buy an 1840's Greek Revival farmhouse that was in desperate need of repair we couldn't have been more excited to tackle the project. As soon as we took ownership of the property, before the house was remotely close for us to live in we knew we wanted to start raising animals. That is when we got our first 3 pigs: Bacon, Porkchop and Miss Piggy. A lot has happened since then - we now breed our own pigs, raising from farrow to finish and have approximately 30 pigs on farm at any given time. We have also expanded to raise pastured poultry. We hope you enjoy following along as we document all the in and outs, ups and downs and twists and turns that are sure to happen as we work on Revival Farm. Our pigs are Berkshire, Tamworth, Yorkshire crosses. These breeds produce a darker more flavorful pork which is often sought out by high end restaurants due to its beautiful marbling. This is not your typical white meat pork. We pride ourselves on spoiling our pigs by providing them a life where they are free to roam and forage in our fields and roll in the mud as they see fit. They are fed a balanced diet which consists of vegetable and bread scraps that come from our kitchen and a few local restaurants and all natural, antibiotic free grain. Our pigs are given names - we talk to them, hand feed them and scratch them behind the ears at least twice a day. We like to think that we have very happy pigs who are raised with love. Kathryn raises cornish cross broiler chickens with Erin Williams through their joint venture, Plympton Poultry. The chicks arrive to our farm when they are just a day or two old and spend the first three weeks of live in a brooder. After that, they are moved to chicken tractors and live on pasture with plenty of access to fresh grass and bugs. The chickens' diets are supplemented with locally milled, all natural, chemical and additive free grain to help them grow. They are brought to process when they are eight weeks old. The finished product is a delicious, tender 4 to 6 pound roaster.